When sunlight strikes a photosynthesizing organism, energy flashes between proteins just beneath its surface until it is trapped as separated electric charges. Improbable as it may seem these tiny hits of energy eventually power the growth and movement of all plants and animals. They are literally the sparks of life. The three clumps of protein a light-harvesting antenna called a phycobilisome and photosystems I and II look like random scrawls in illustrations but this is misleading. They are able to do their job only because they are positioned with exquisite precision. If the distances between proteins were too great or the transfers too slow, the energy would be wasted and ultimately all entropy-defying assemblages like plants and animals would fall to dust. But until now scientists weren't even sure the three complex cohered as a single sun-worshipping megacomplex. Previous attempts to isolated connected complexes failed because the weak links that held them together broke and the megacomplex fell apart. In the Nov. 29 issue of Science scientists at Washington University in St. Louis report on a new technique that finally allows the megacomplex to be plucked out entire and examined as a functioning whole. Like a seamstress basting together the pieces of a dress, the scientists chemically linked the proteins in the megacomplex. Stabilized by the stitches, or crosslinks, it was isolated in its complete, fully functional form and subjected to the full armamentarium of their state-of-the-art labs, including tandem mass spectrometers and ultra-fast lasers. The work was done at PARC (Photosynthetic Antenna Research Center), an Energy Frontier Research Center funded by the Department of Energy that is focused on the scientific groundwork needed to maximize photosynthetic efficiency in living organisms and to design biohybrid or synthetic ones to drive chemical processes or generate photocurrent. Robert Blankenship, PhD, PARC's director and the Lucille P. Markey Distinguished Professor of Arts & Sciences, said that one outcome of the work in the long term might be the ability to double or triple the efficiency of crop plants now stuck at a woeful 1 to 3 percent. "We will need such a boost to feed the 9 or 10 billion people predicted to be alive by 2050," he said. The scientists worked with the model organism often used to study photosynthesis in the lab, a cyanobacterium, sometimes called a blue-green alga. In free-living cyanobacteria the antenna, called a phycobilisome, consists of splayed rods made up of disks of proteins containing intensely colored bilin pigments. 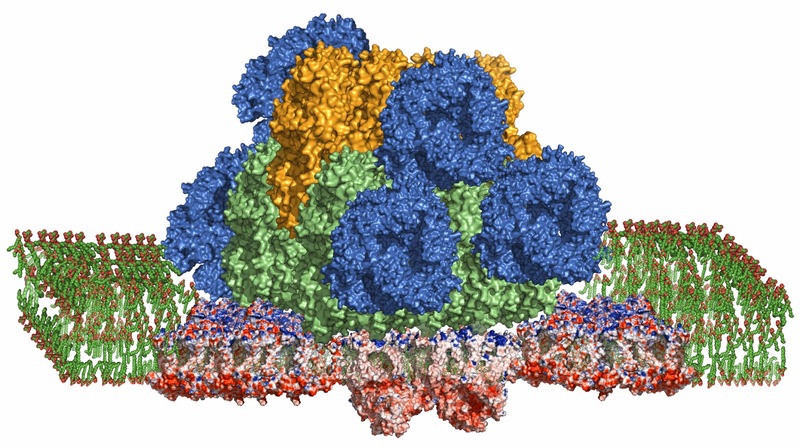 The antenna sits directly above one reaction center, Photosystem II, and kitty corner to the other, Photosystem I.
PARC research scientist Haijun Liu, PhD, proposed stitching together the megacomplex and then engineered a strain of cyanobacteria that has a tag on the bottom of Photosystem II. To figure out how the proteins were interconnected, the scientists repeatedly cut or shattered the proteins, analyzing them by mass spectrometry down to the level of the individual amino acid. The amino acid sequences derived in this way were then compared to known sequences within the megacomplex, and the location of cross links between different complexes helped establish the overall structure of the megacomplex. "It's a very complicated data analysis routine that literally generates tens of thousands of peptides that took a team of students and postdoctoral associates overseen by Hao Zhang and Michael Gross, months to analyze," Blankenship said. Hao Zhang, PhD, is a PARC research Scientist and Michael Gross, PhD, is professor of chemistry and Director of the Mass Spectrometry Resource in Arts & Sciences. 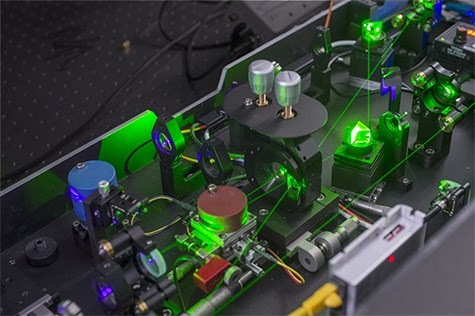 In the meantime research scientist Dariusz Niedzwiedzki, PhD, in the PARC Ultrafast Laser Facility was exciting the phycobilisome in intact megacomplexes and tracking the energy through the complex by the faint glow of fluorescencing molecules. Typical energy transfers within the complex take place in a picosecond (a trillionth of a second), way too fast for humans to perceive. If one picosecond were a second, a second would be 31,700 years. "PARC is one of the only places in the world that has available this sophisticated combination of experience and advanced techniques," said Blankenship, "and to solve this problem we were brought all of our expertise to bear. "The work provides a new level of understanding of the organization of these photosynthetic membranes and that is something that a lot of people have tried to understand for a long time," he said. "It also introduces the methodology of the crosslinking and then the mass spectrometry analysis that could potentially be applicable to a lot of other complexes, not just photosynthetic ones," he said. "For example, enzymes in some metabolic pathways have long been thought to form supercomplexes that channel the products of one reaction directly to the next one. This technique might finally allow channeling supercomplexes to be identified in cases where the complex is only very weakly associated," he said. "Phycobilisomes Supply Excitations to Both Photosystems in a Megacomplex in Cyanobacteria" Science, 2013.